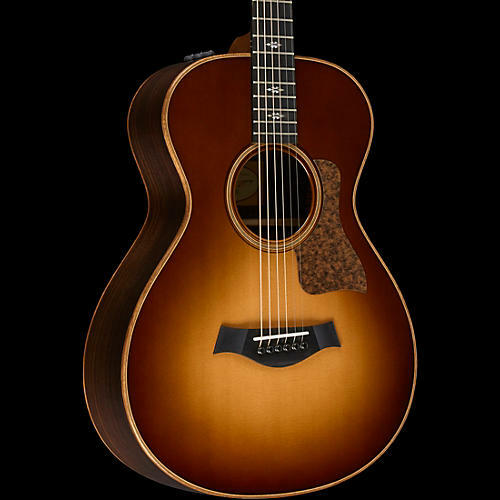 Taylor’s redesigned rosewood/spruce 700 Series guitars are the latest in the Taylor line to showcase an inspiring tonal and visual makeover. The result is a bolder musical voice with a refreshed visual aesthetic that blends rootsy appeal with warm, wood-rich details to give the series a distinctive musical personality. Tonal upgrades include a switch from Sitka spruce to Lutz spruce, which produces a powerful tonal response comparable to older, high-grade Adirondack spruce, and gives players a higher volume ceiling. Two other tone-enhancing refinements include Taylor’s new Performance bracing and the use of protein glue for the bracing and bridge. Together with the Lutz top they optimize the tonal response, capturing all of rosewood’s classic richness and strengthening the fundamental focus. These guitars promise to give back to players everything they put in and then some. New appointment details include non-figured koa binding; a 3-ring herringbone-style rosette featuring mirrored, bias-cut Douglas fir with maple/black trim; top edge trim of bias-cut end-grain Douglas fir with maple/black accents; a new “Reflections” fretboard inlay in pale green abalone; and a new weathered brown pickguard with a matte finish. A new Western sunburst top option is also available, adding an earthy honey-brown complexion for a darker vintage look. The 712e also includes Taylor Expression System 2 electronics. This 712e comes with a Taylor deluxe hardshell case. Taylor's Grand Concert is slightly smaller that its Grand Auditorium and yields controlled overtones, so the sound won't occupy a lot of sonic space. This is often a key consideration when other instruments are in the mix, such as in a performance or recording environment, and it allows the guitar to be heard more clearly. The Grand Concert pairs well with both 14-fret and 12-fret neck-to-body construction and offers an articulate voice with top-end chime. It's perfect for fingerstyle players and light strummers, though flatpickers are known to enjoy its tonal character too. Its intimate size makes it lap/couch-friendly, and a great fit for players who find smaller instruments more physically comfortable. A guitar's top is the primary filter and distributor of vibrating string energy through the guitar, which means it has a huge impact on its sound. The 712e features Lutz Spruce, a naturally occuring hybrid of Sitka and White spruce. Sitka is the most prevalent guitar top wood of the modern era because it blends stiffness and elasticity in just the right proportions which translates into broad dynamic range with crisp articulation. Lutz spruce takes these attributes and blends them with those of White and Englemann spruce, with an end result resembling old Adirondack spruce. When combined with Taylor's bracing architecture, guitars are more powerful, richer and louder than before. The 712e's solid Indian rosewood back and sides complement the Lutz top with sound that's made it one of the most popular tone woods ever. Rosewood produces the strongest bass response among the tone woods commonly used for guitars, with a slightly scooped midrange. Rosewood's sweeping frequency range - deep lows that assert a throaty growl with sparkling highs - rings out with bell-like, high-fidelity clarity. It yields a full-range acoustic voice with complex overtones and extended sustain. Taylor's ES2 is a revolutionary pickup design that delivers the latest in Taylor’s ongoing innovation in acoustic guitar amplification. The heart of the Expression System 2 is Taylor’s patented behind-the-saddle pickup, which features three uniquely positioned and individually calibrated pickup sensors. Because the pickup doesn't sit under the saddle, the bottom of the saddle comes in full contact with the bridge, allowing all the nuance of the guitar's tone to come through clearly whether playing acousticly or plugged-in. The location of the sensors enables a more dynamic range of acoustic sound to be captured than ever before while playing plugged-in. Together with Taylor’s custom-designed “professional audio”-grade preamp, this system produces exceptional amplified tone and responsiveness. On stage through a PA, plugged into your favorite acoustic amplifier, or direct into recording software, the Expression System 2 faithfully conveys the voice of your Taylor guitar. The Taylor Expression System 2 operates through a proprietary 9-volt battery compartment and easy-to-use volume, bass and treble controls.